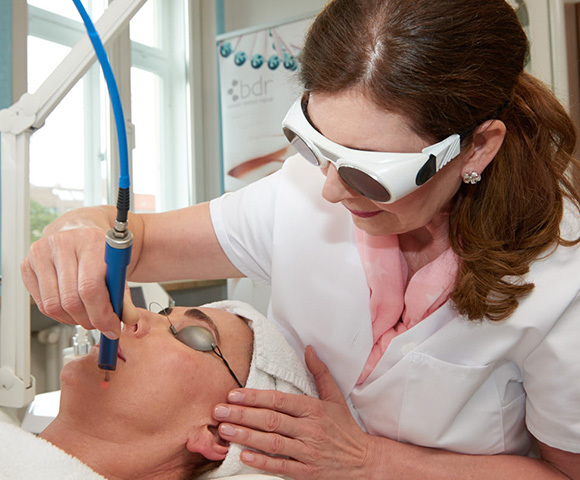 Here, laser light is used to target the causes of skin blemishes and impurities. This activates the skin’s own immune system, triggering skin regeneration and increased collagen production in the areas affected, and thus visibly reducing scars. of patients experienced an improvement of over 50%. "Living with flaws – when beauty is unattainable." The programme is about a serious case of problem skin that was successfully treated at our Institute using NLite™ V3 by perfect skin. It involved a television crew following the patient’s course of treatment for several weeks. If you have any questions in this respect, please do not hesitate to contact us either by email info@fine-skin.com or by telephone +49 (0)89/21 66 56 60. 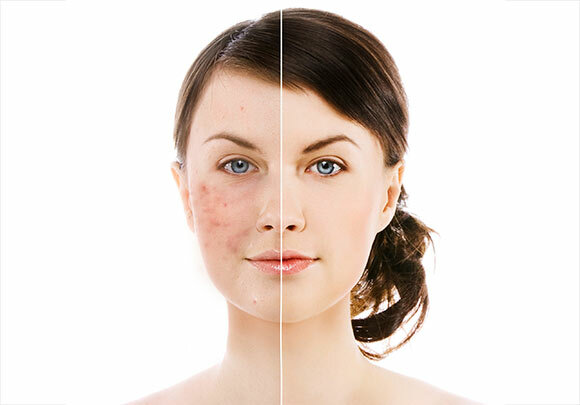 At most, you will experience a slight redness and perhaps some very light swelling. You will easily be able to go about your normal everyday business directly after treatment. Can I wear make-up immediately after the treatment? Are there any medications I should avoid in the periods before and after my NLite™ V3 treatment? You should refrain from taking antibiotics at least 14 days prior to your treatment. You should also refrain from taking medication, such as Roacutan, at least 6-8 weeks before your treatment and you cannot take medication during NLite™ V3 treatments. You should also avoid tablets as well as drinks containing aloe vera. Allergy medication and strong painkillers are also to be avoided if possible. What can I use on my skin? Only use very mild cleansing and care products directly before and after a NLite™ V3 treatment. Do not use antibacterial products or products containing aloe vera. Using products containing glycolic acids a few days after your treatment will further enhance its positive effects. What does the NLite™ V3 treatment feel like? The treatment is practically painless. You may occasionally feel a brief hot sensation for each spot treated. Altogether, the preliminary treatment (cleansing, microdermabrasion, lymph drainage) and the main NLite™ treatment will take around 1.5 hours. If I have problem skin and/or scarring, how many treatments will I need to clear up my complexion? If you have a lot of stubborn spots and black heads, you will generally need 3-5 treatment sessions. After that, you may need to have smaller areas lasered every once in a while. With scars, treatment effectiveness will depend on the depth of the skin indentations. As a rule, 3-5 treatments will likewise be necessary. You will see an improvement in your skin after just a few days, and a significant reduction in the depth of your scars after a few weeks. The collagen generating process triggered by the NLite™ treatment will continue for at least 90 days. Is NLite™ V3 laser treatment also effective against black head scars and other types of scarring? Yes. Scarred skin will improve quickly. After all, NLite V3 boosts the body’s collagen production by over 80% after only one treatment. Can I go out into the sun after my treatment? Yes, although you should always wear sun protection and avoid exposure to very strong sunshine as this negatively impacts your skin’s immune system. NLite™ V3, in contrast, strengthens your skin’s immune system. In this respect, the sun and the laser treatment are adversaries of sorts. Can the treatment be used on all skin colours and skin types? Can I exercise after my NLite™ V3 treatment? Yes, that is no problem at all. However, please do not swim in chlorinated water for at least 5 days after your treatment. The fumes from chlorinated water can negatively affect the ‘work’ of the NLite™ V3 treatment. The NLite™ V3 treatment should not be undertaken during pregnancy. What can I do to further enhance the treatment results? Only use a good but gentle cleanser on your skin, and eat a balanced diet high in fruit, vegetables and fish, and low in animal fats, i.e. meat and milk products. 87% of those treated experienced a substantial improvement. 58% of those treated experienced an improvement in their symptoms of over 50%. No guarantees are provided in this respect.